You’re going to love the sights. The sounds. The tastes. And the glorious salty breezes off the Atlantic Ocean in Savannah, Georgia. This place is so cool – actually, it’s comfortably warm. At any rate, we know you’ll go gaga over the Historic District speckled with Victorian era shops, restaurants and hotels. It’s a perfect combination of historical and contemporary attractions, plus the beautiful beach resorts of the Golden Isles. Southern living never felt so good! We know what you want. You want solitude. You want natural island beauty. You want comfortable and well-appointed accommodations. You want The Lodge on Little St. Simons Island. Accessible only by boat, this private 10,000-acre island just off the Georgia coast awaits you. This is as close to complete, unscathed seclusion as you’re going to get. Unless you prefer “roughing it” in the Alaska wilderness. But why fight off growling bears and hunger when you can stay in one of only five unique cottages with guestrooms throughout the lodge’s property, enjoy hearty prepared meals and walk along miles of seashell-laden shore? The cottages, dating back to 1917, offer a warm and welcoming ambiance, like that of the Hunting Lodge which reminds you of something from the pages of Hemingway. At this all-inclusive resort, your stay includes delectable Lowcountry meals drawing from the surrounding waters. Spend some time with your loved one boating, hiking and cycling on the island and its shores or attend a guided and interpretative family program. 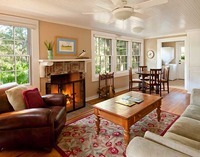 Take time out of your busy life and schedule in some “you” time at The Lodge on Little St. Simons Island. Little St. Simons Island is most easily accessible from the St. Simons Island Airport or Brunswick Airport (BQK). You may also reach The Lodge from the Savannah Airport (SAV) or the Jacksonville Airport (JAX). Little Simons Island is located along the Atlantic Flyway. More than 280 species are attracted to the differing island habitat types. The Lodge offers day trips with a guided island tour and interpretative programs and a selection of delicious local fare for lunch. We’ve heard of renovated resorts in Savannah. After all, many of them are two centuries old or more. But we have to tip our caps to a Savannah resort that’s been re-imagined – which is why the Westin Savannah Harbor Golf Resort and Spa lands in our No. 1 spot. Westin’s prolific imagination has resulted in Savannah, Georgia’s only urban resort, with 403 Internet- and iDock-equipped guestrooms and luxury suites. You get the flavor of Savannah’s historic River District, the natural tinge of the Georgia Lowcountry and plenty of activities that reflect both the classic and the modern getaway. A big part of the latter is the area’s only PGA championship golf course – a natural addition to the famous bluffs and marshlands of the Colonial Coast and part of the Club at Savannah Harbor. This 22,000-sq.-ft. clubhouse also features the relaxing and rejuvenating Heavenly Spa by Westin™, the newest and largest in Westin’s collection. You see what we mean. The Westin Savannah Harbor Golf Resort and Spa is the historic, luxury Savannah vacation you’ve imagined – only re-imagined! If you feel like there’s just too much to do at the Westin Savannah Harbor Golf Resort and Spa, the weekly calendar should help. It includes organized bicycle and golf cart tours, poolside fun, bocce ball, croquet and our personal Savannah favorite - ghost stories by the harbor-side fire pit. The Westin Savannah Harbor Golf Resort and Spa overlooks both the Savannah River and Savannah’s historic River Street – the heart of the largest historic district in the nation. 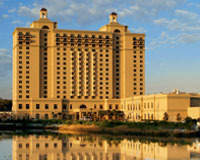 The Westin Savannah Harbor Golf Resort and Spa features more than 35,000 sq. ft. of indoor and outdoor function space including an 11,500-sq.-ft. Grand Ballroom, and rests adjacent to the Savannah International Trade and Convention Center – ideal for Savannah meetings, weddings and group events. Tired of feeling like Mr. Hyde – worn down and maybe a bit repugnant? You can change that when you stay at Beachview Club, located on the beautiful and highly-respected Jekyll Island in the Golden Isles of Georgia. This elegant oceanside estate is close to renown historic sites and fantastic dining. Although there are no onsite restaurants at Beachview, this 38-room resort is only minutes away from the shopping and dining district on Jekyll Island. Plus, the Oceanside Sandbar and Grill is right next door – in ideal walking distance – so don’t hesitate to order another island concoction! Because the resort’s on the smaller side, it concentrates on providing excellent customer service with top-notch accommodations. A sparkling heated pool and hot tub are only steps away from the oceanfront and courtyard rooms and suites with wet bars, private patios and fireplaces. The Beachview Club also offers magnificent Oceanside venues for wedding, reunions and group functions. Regardless of if you’re with a corporate group of 20 or an intimate party of two, you can rest assured that staying at this family-run resort means close proximity to the 63 holes of championship golf, tennis, fishing and beach horseback riding Jekyll Island has to offer. Boating, fishing, island tours, bird watching and swimming. From 1-95, take the Georgia Exit 29. Turn north onto Hwy. 17 and right on the Jekyll Island Causeway to the Collection Station. After paying the $3 toll, go straight to the stop sign and take a left. The Beachview Club will be on your left in two miles. Beginning in 1886 and continuing for more than 40 years, Jekyll Island was the exclusive domain of the renowned Jekyll Island Club - the winter retreat for some of America's most elite families. Once you step into the onyx marble lobby of the Mansion on Forsyth Park, you’ll know you were meant for greatness – well, at least for a great night’s stay. A grand example of Southern elegance, this Victorian mansion set in Savannah’s Historic District houses a 400-piece original artwork gallery. You’d better bring your bathrobe to lounge in when you stay in one of the hotel’s 126 lavish guestrooms or suites because you are in for some serious pampering. As a AAA Four Diamond Award recipient, Mansion on Forsyth knows how to treat you well. By well we mean the rooms’ all-white down bedding, mini-bars and in-room dining. And the view of the prestigious Forsyth Park. Don’t forget the Poseidon Spa, where you can indulge in an aromatherapy massage or body wrap. After you’ve sufficiently unwound, meander through the Grand Bohemian Gallery with more than 400 rare works of art or look out on Savannah at its finest on the rooftop terrace of Casimir’s Lounge. And you have to visit the Carriage Wine Cellar because you know a nice glass of vino would pair perfectly with that oversized soaking whirlpool tub in your room – now that sounds like a date! From the Savannah International Airport, take I-95 South to I-16 East to downtown Savannah where it changes into Montgomery Street. Turn right on Liberty Street and right at Whitaker Street. Go past Forsyth Park and turn left at Park Ave. and left at Drayton Street. Mansion on Forsyth Park will be on your right. The Mansion on Forsyth Park was built in 1888. 700 Kitchen Cooking School, outdoor relaxation pool, 24-hour business center, Marble Garden Courtyard and Viennese Ballroom. Paces. Strides. Maybe hops? Whatever you call it when you move your body from one point to the next, you’ll be doing it a lot at AVIA Savannah. Why? Because it’s in the heart of the Historic District – only 50 steps from Paula Deen’s The Lady and Sons restaurant and City Market. And that’s not all! Historic Ellis Square. News Place Courtyard. River Street. The list of Savannah’s most fun, historic and intriguing attractions goes on and on and AVIA Savannah is in the middle of it all. But let's not get caught up on just the fabulous location. The 151 guest rooms and suites in the six-floor hotel boast sumptuous amenities, including Italian linens, waffle terry bathrobes and pedestal bath tubs. And the spa, dry cleaning and laundry services are great extras. There has to be more, though, right? Yup, there is. AVIA Savannah wants you to get the most out of your Georgia vacation so AVIA Tastemakers – locals well-versed in the sights, sounds and tastes of Savannah – are onsite and waiting to give you tips and suggestions for the best experiences during your stay as well as samplings at the AVIA Kitchen and Wine Bar. AVIA Savannah is just 25 minutes away from the Savannah/Hilton Head Airport. Colonial Savannah is said to be the home of many ethereal residents. See – or feel – for yourself during a live ghost tour. Outdoor terrace, fire pit, fitness room, concierge and bell services, pool, Grand Parlor and organic coffee. 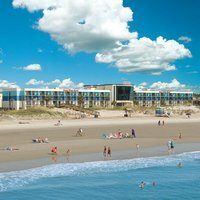 If you’re in search of sprawling white-sand beaches on your Georgia getaway, stay at Ocean Plaza Beach Resort on Tybee Island, voted one of North America’s Top 25 Affordable Beach Vacations by Conde Nast Travel Magazine. Action, comfort and location – this resort has it all! You’re so close to the beach that you’ll probably have to wipe off your wet feet before tracking them into your one- to three-bedroom guestroom, suite or luxury condo with fabulous island and ocean views. If you'd rather get outside and enjoy the warm weather, head over to the Tybee Pier and Pavilion, just down the beach from Ocean Plaza. Or go on a dolphin tour. And to fill your empty tummies after a day of Georgia sunshine, eat at the award-winning Dolphin Reef Oceanfront Restaurant and Sports Bar. You want to know why Ocean Plaza knows how to show you spectacular Southern comfort and fun? This beachfront resort property has been on Tybee Island for more than 120 years! So it was there when the most of the restaurants, shops, museums and historic sites where erected. Now you can become part of the history. Kayaking, fishing, fitness center, nature trails, historical sites and monuments, museums, shopping, boat tours and biking. From Savannah, take U.S. Hwy. 80 East to Tybee Island. The Ocean Plaza Beach Resort is located between 14th and 15th Streets. Since Tybee Island's discovery in 1520, seven different flags have flown over the island, including early Spanish, French and Pirate flags. “Oooh!” You’ll say when you step off the riverside cobblestone street in Savannah’s Historic District and into The Bohemian Hotel. Contemporary yet reminiscent of the bygone era of the 18th century British maritime settlers, the 75 tailored luxury guestrooms will make you happy. Very happy. British campaign furniture decorates the rooms and lobby of the Bohemia, along with driftwood, unique brick formations and original artworks by renowned artists. Combined, these elements make the Mansion on Forsyth’s sister hotel lavish yet inviting. And you’ll feel especially welcome with the valet and concierge services. Given its location near a variety of Savannah’s historic parks, shops and art galleries, it's a tough decision whether to stay at the hotel and explore the Bohemia Rooftop Lounge or take a walk along the Savannah River. Luckily, you can do it all! Before heading out the door, fuel your body with a delicious meal at the Rocks on the River Modern Grill or try the in-room dining services. And if you’re planning a wedding or corporate meeting, the Executive Boardroom and the rooftop lounge the perfect Savannah location. The Historic District is comprised of 1,600 historic and architecturally significant structures all within a 2.5 square mile area. Encompassing nearly two square miles, Savannah is home to the nation’s largest urban historic district. Steeped in glamorous yet turbulent history, the Jekyll Island Club Hotel has risen again to become one of Jekyll Island’s premier resorts. Stay on the smallest of the Golden Isles and immerse yourself in Southern elegance and hospitality at this Victorian beauty. It once offered the elite a place to socialize, boat and enjoy the sparkling Atlantic in style. But when the Great Depression rolled around, the club lost half its memberships. The state ended up buying the island once threats of enemy submarines off the coast came through during WWII. Well, more then 60 years later, the club has been retransformed into a 157-room and -suite resort with fine dining and more than 50 activities. Historic tours, carriage rides and croquet will help you imagine how the resort was like during its heydays. Stay in the one of five historic settings on the grounds: The Clubhouse, The Annex, Sans Souci, Crane Cottage and Cherokee Cottage. Dine on local and international cuisine in the Grand Dining Room, Courtyard at Crane or Café Solterra and visit the one-of-a-kind Georgia Sea Turtle Center. You’ll love this place, we swear! The Jekyll Island Club Hotel is located on Jekyll Island off of I-95 (Exit 29) about midway between Savannah and Jacksonville. 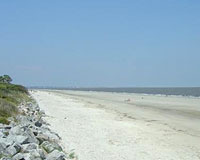 Jekyll Island is about 5,700 acres and has a limit of 33 percent business development to preserve the natural integrity or the island. Tennis, golf, airplane fly-ins, yacht docking, pools, sea shell and bird walks on deserted beaches, children's programs and horseback riding.